What a terrific way to end Tony's tenure with NCIS! It's difficult to recall a more exciting episode, with revelation after revelation hitting us from all sides. NCIS Season 13 Episode 24 brought us the satisfactory conclusion to the season arc about Trent Kort. And, as predicted, his life came to an abrupt end as almost every member of NCIS got a chance to unload their guns into him. More important was what happened with Tony's life. It's like he stepped up a whole rung on the ladder of evolution, all in one episode. 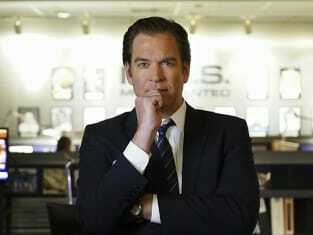 And didn't Michael Weatherly just shine with the full range of emotions that Tony experienced? For starters, there was that intense anger in the bullpen, after finding out that Ziva had been killed. He's been angry before, but never to that degree: face completely red, with tears forming. Pure, shaking, pounding the desk, over the top rage, even at Gibbs. Much as I hate to say "I told you so," it turns out I was right about Ziva being dead. Even the Twitter poll that I ran had it 60-40 in favor of her still being alive. So while that didn't come as a surprise, the fact that she and Tony had a daughter together certainly did. You could see how overwhelmed he initially was. This tiny little thing was so demanding and playful and obstinate....and he had to come up to speed so fast on being a dad with zero knowledge on how to do so. Any father out there could readily appreciate his angst over Tali: we still don't know how much English she knows, and he had no idea how she viewed him. As far as he was concerned, chances were pretty high Ziva didn't enlighten her about her father. So his repressed joy at realizing she recognized his picture, and that she knew him as "Abba" (daddy) was intense. We all could feel it. Such a beautiful picture. I laughed out loud when we saw them playing on the couch. The two were just perfect together, father and daughter. It seemed strange, even surreal that Tony was the one guy not truly active in the hunt for Kort. He wanted to apprised of any developments but the legwork was all done by the rest of them, including Clayton and Monroe. Speaking of Clayton....it's great to see that he really isn't another Tony. He's a combination of action man and geek, so he'll fit in very well with the team, in his own unique way. I can't see him playing second to McGee, however. And there could very well be a power struggle of sorts between him and Monroe. The possibilities for NCIS Season 14 are endless. There were two scenes with Gibbs that seemed classic. Right there, you could appreciate the fact Tobias is the one guy in the world who Gibbs absolutely loves. Fornell is his brother, through and through. Even with the weird toes. And again, on the father front.....watching Fornell chuckle at how his daughter painted his toenails made me laugh. Any father with a precocious daughter could appreciate that. The other Gibbs scene was just about perfect. That's Gibbs, in a nutshell: master of the understatement. Watching Grace try to pull some emotions from Gibbs was, we all knew, an exercise in futility. Gibbs wasn't about to tell her about how he felt about any of it, probably because he doesn't really have much to feel. He specializes in being in the moment, not in reminiscing or in worrying about the future. Maybe it's not entirely healthy, but that's who he is. I like how she calls him "Popeye" though. It's going to be different. There were two girls who played Tali. Gary Glasberg revealed that she was played by twins. Glasberg also talked about trying to figure out what would motivate DiNozzo to leave the team. It couldn't be another job or another romance. Enter: Tali. Abby's tears in the elevator had little to do with Tony leaving, and everything to do with Michael Weatherly leaving the show. That, according to Pauley Perrette. McGee is now the new Tony, in terms of rank. Yeah, sorry – I just can't buy it. The scene where McGee gave Gibbs a pep talk in the hallway just seemed horribly awkward. It really, really didn't work. This show was such an event we went a little overboard with the NCIS quotes. To be fair, there were an awful lot of great dialogues though. Highest honors goes to Tony's remark to Gibbs: I've never been anybody's everything before. This was such a powerful episode that it's worth seeing again, if only to pick up on the nuances scattered throughout. You can do that right here, when you watch NCIS online. I know I speak not only for myself but for thousands of viewers when I say: we're going to miss both Tony the character and Michael Weatherly the actor who played him. He was such a key part of the team. It's like when Chrissy left Three's Company: you can fake it all you want, but the show can never be the same. Or picture Cheers without Norm or How I Met Your Mother without Barney. You get the picture. Now it's time for you to have your say. Let us know your thoughts on this bittersweet season finale.